@WillSmith & @JadaPinkettSmith Donate $5 Million Dollars To @TyreseGibson! 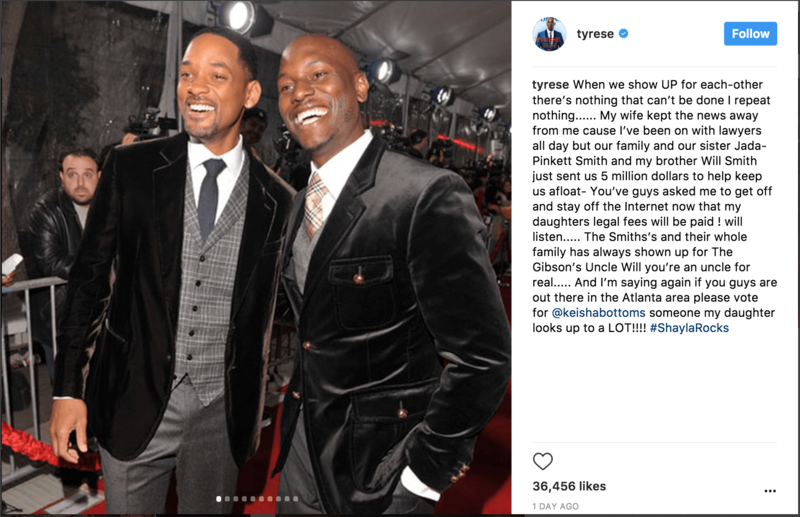 Tyrese Gibson is known for sharing his frustrations and personal life out on social media and this update is no different. Recently, ‘The Fast and the Furious’ star took to social media to inform followers that the Hollywood power couple Will Smith and Jada Pinkett-Smith donated $5 million dollars to him while he was going through his custody battle over his daughter, Shayla. “When we show UP for each-other there’s nothing that can’t be done I repeat nothing…… My wife kept the news away from me cause I’ve been on with lawyers all day but our family and our sister Jada-Pinkett Smith and my brother Will Smith just sent us 5 million dollars to help keep us afloat-You’ve guys asked me to get off and stay off the Internet now that my daughters legal fees will be paid ! will listen….. The Smiths’s and their whole family has always shown up for The Gibson’s Uncle Will you’re an uncle for real.” Gibson wrote on Instagram with a collage of photos of the two men together.